"20 Eyes" is a song originally performed by horror punk progenitors Misfits. It was written and composed by Glenn Danzig and released on Misfits' 1982 debut album Walk Among Us. "20 Eyes" was covered live by Bucket Of Weenies, a band both Chester Bennington and Ryan Shuck were part of, from 2005 to 2006. 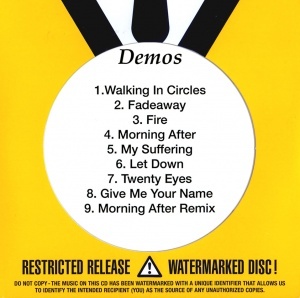 During the sessions of Dead By Sunrise's first and only album, Out Of Ashes, a version of "20 Eyes" was recorded in studio and was intended to be a bonus track on the album in Japan or some parts of Europe along with "Morning After". When questioned about the song after the release of the album, Elias Andra said, "We also did record a cover of “20 Eyes.” Where, when, and how it will be released is yet to be determined! Although I think a bootleg live recording would probably be a better release. It’s more punk rock when it’s live!!" Although the song was never released, it was regularly played live by Dead By Sunrise with altered lyrics. Other artists who covered the song includes Sparrow Falls, Anarchy Club, Shades Apart, and Kopfschmerzen. "20 Eyes" was performed by Dead By Sunrise starting on the Out Of Ashes Promotional Tour in late 2009. It served as the band's closing song for nearly every show since it's debut, barring the most recent show: the acoustic set at 2011's 'Stars Of The Season' Gala. This page was last edited on 20 March 2018, at 12:03.